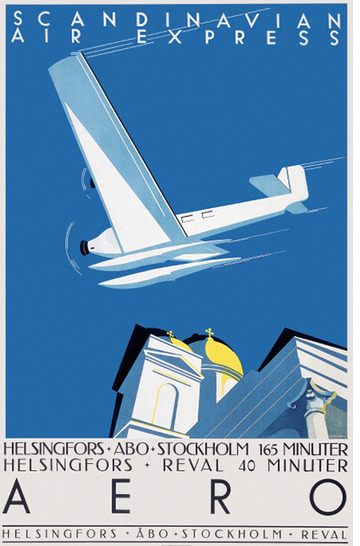 This is a true poster classic by the master Jorma Suhonen: A Junkers Ju 52/3m flies past the Helsinki Cathedral. And it’s not as absurd as it may look. At the time (in 1933) Helsinki actually didn’t have a “regular” airfield, so the planes landed at the terminal on nearby Katajanokka – with pontoons on the water. Not until a few years later the airport in Malmi in northern Helsinki opened. The first flight connection between Tallinn in Estonia and Helsinki was established already on 29 June 1923. 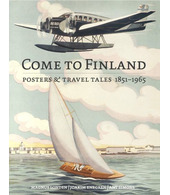 This was the start of the Aero airline, which later became Finnair. Aero realised early the potential of poster advertising and invested from the beginning in high-quality advertising graphics. Whole poster series were printed in a particular style with spectacular perspective and preferably with aeroplanes on a background of famous urban sights or alternatively mighty natural landscapes. In the 1930s the carrier started an extensive co-operation with the newlyfounded advertising agency SEK (the S stands for Suhonen) – and this still continues. 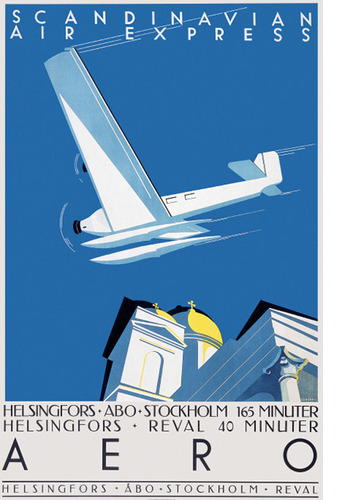 It is mainly the Aero posters by Jorma Suhonen, the agency’s strong man, that are still celebrated to this day.